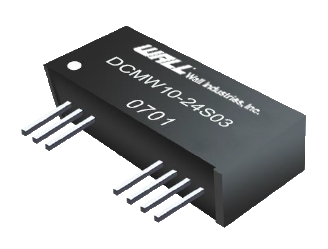 The DCMW10 series of DC/DC converters offers up to 10 watts of output power in a compact 1.27” x 0.43” x 0.60” SIP package. This series consists of single and dual output models with a wide 4:1 input range. Features of this series include high efficiency, short circuit protection, and UL94V-0 package material. This series is RoHS compliant, has been 100% burned-in and is designed to meet AAMI/CSA 60601-1, IEC/EN60601-1 3.1 edition. Please contact factory for order details. Notes: Due to advances in technology, specifications subject to change without notice.